It was not enough for the Free Syrian Army to improvise small arms and remote control weapon stations, but they developed a number of modifications for vehicles as well. They have not only repaired damaged tanks and put them back in service, but they have also used pick-up trucks to which they mounted different types […] Read More … The post FSA TECHNICALS (Part 1): BMP Turrets on Pick-Ups appeared first on The Firearm Blog. PDF>MOBI Random blank pages inserted no matter what I do. 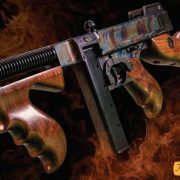 Auto Ordnance Corporation (of the Kahr Firearms Group) has unveiled a NEW Thompson Case Hardened Tommy Gun chambered in the traditional .45 ACP with looks that could kill. The aesthetic, swirling-water appearance of case hardening that is most closely associated with revolvers looks right at home on the side of their newest Tommy Gun. This […] Read More … The post NEW Lead Slinger! Thompson (Auto Ordnance) Case Hardened Tommy Gun appeared first on The Firearm Blog. For those of you who have been following Plastic and Plush for a while, you might recall all of our Uglydolls coverage throughout the years. Well, David + Sun-Min's creations are making their way tot he big screen in 2019. And the official trailer recently launched itself upon the world. This could become you new favorite movie. Highly recommended. Pleistocene, 20,000 BP Europe. Filmed in Canada. Film goes after authenticity and does a great job. It's a coming-of-age story, revolving around the unlikely alliance of a young hunter and a wolf. A great portrayal of the stark reality of life during the last ice age. The Overlord movie is a fictional story set in WW-II with a good bit of classic sci-fi and shoot-em-up thrown in. It's an adventure of sorts, where American soldiers stumble upon secret Nazi laboratory. It's a JJ Abrams film and follows his typical methods of excitement and storytelling. I must admit, I loved it. It's an absurd story, but I knew that going in. The fighting + shooting, the characters, the action, all over the top. Just the way I like it. If you like action, this one has it.